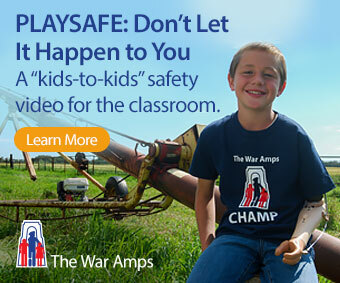 Because of the importance of water to the health and well-being of all Earth’s inhabitants, and because of multiple threats to water supplies worldwide, a focus on water is a timely topic for classroom study at any grade level. By planning ahead, you will be ready to celebrate World Water Day in March. World Water Day is a United Nations international day of observance celebrated annually on March 22. The focus for this day is on the sustainability of fresh water resources and the importance of global access to clean water and sanitation. UN-Water chooses a different theme each year and is supported by organizations that are related to that theme. The first World Water Day was observed on March 22, 1993. Each year UN-Water also releases A World Water Development Report that focusses on the current theme. 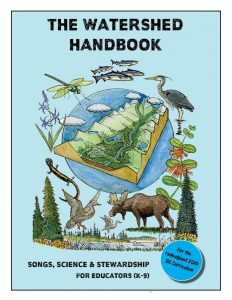 This thoughtful, well organized and effectively illustrated resource (lots of diagrams, charts, maps and photographs) is designed around the new BC Science and Social Studies curriculum and can be used in a number of ways by the classroom teacher. Note: Water for Life is a television special that originally aired on May 14, 2016 on CTV 2 in Alberta. Featuring the music of Holly Arntzen and Kevin Wright, this one-hour broadcast is now available to view at the artist response team website. The presentation includes music from the Wilds band (with the participation of a children’s choir) as well as up to date facts and information about Canada’s fresh water resources. What kid wouldn’t want to know how many litres of water it takes to make a smartphone? Enough Water? is a timely and insightful book that explains to young readers the extent to which water consumption affects the world around them. The colourful illustrations and very clear graphs make this information accessible to a broad range of reading levels. Other issues addressed include limited sources of freshwater, drought and pollution. 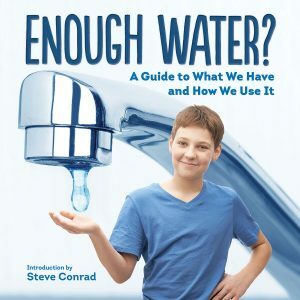 The book ends with water saving tips (bathroom, kitchen, laundry and outdoors) as well as some suggestions to adults for lifestyle changes that would conserve water. Enough Water? is a great source of information that would support a number of science and social studies classroom themes including a study of fresh water ecosystems, the water cycle, climate change, the consumption and preservation of our fresh water resources. True to its title, this book clearly explains to young readers how all water on earth is connected (from raindrops, rivers, lakes, oceans, ponds, wetlands and even icecaps, all water is part of one global well). The water cycle is also explained and the dependance of all living things on clean water sources is made clear. One Well describes some of the pressures on our freshwater resources (e.g., pollution, increased demand due to growing populations) and ends with a call to action (ways to conserve and protect water). 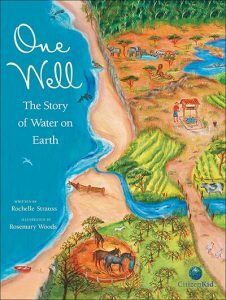 One Well is a beautifully illustrated and colourful book that would support science and social studies themes including: the water cycle, plant and animal habitats, the consumption and preservation of freshwater resources. 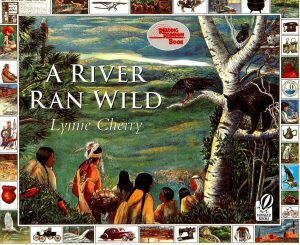 A River Ran Wild is an illustrated environmental history (1400 – 1990) of the Nashua River. The book begins with a description of the pristine river valley and then introduces the settlement of the Algonquin peoples in the 1400s, the colonial settlements in the 1600s, and the effects of the industrial revolution and dam building in the 1800s. By the mid 1900s the Nashua river system was declared ecologically dead. In 1962 Oweana (a descendant of the first Algonquin settlers), Marion Stoddart and the Nashua River Cleanup Committee began to clear away garbage from the banks of the river and to lobby for laws to protect all rivers in the US. In 1966 the Massachusetts Clean Water Act was passed and the National Environmental Protection Agency was established. After many years of hard work the Nashua River system was finally restored. A River Ran Wild would make a great read aloud book for primary classrooms and with adult guidance it would make an effective springboard to a study of the effects of pollution on our freshwater ecosystems today. It is also a wonderful example of how the determination of a few individuals can make a difference in the world. The Water Walker tells the true story of Josephine Mandamin, an Ojibwe grandmother (Nokomis), who walked 5,144 kilometres to raise awareness of the need to conserve and protect water (Nibi). She inspired others to join her as the Mother Earth Water Walkers. Together, they have walked around all the Great Lakes. Josephine completed her last walk in 2017. The story incorporates many Ojibwe words which are explained in an illustrated glossary and pronunciation guide. Playful, colourful illustrations accompany the text. 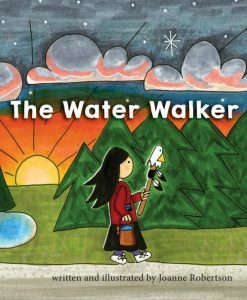 The author/illustrator of The Water Walker, Joanne Robertson, is the founder of the Empty Glass for Water campaign that aims to bring attention to the drinking water crisis in indigenous communities across Canada (emptyglassforwater.ca). 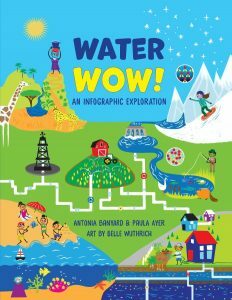 This book will appeal to visual learners—facts about water are presented in short information bites, formatted graphically with lots of colour and humour. I suspect that most questions that students will have about water will be answered somewhere in this book! Brenda has 35 years of classroom experience. She has presented workshops on literacy strategies, and has written a number of resources for teachers. She remains passionate about matching up kids with books.